..".an eye-opening adventure that touched me deeply...this powerful story continues to resonate in my heart long after the last page was turned." -New York Times #1 best-selling author Cheryl Richardson The Seven Perfumes of Sacrifice, Amy Logan's controversial debut novel - over a decade in the making - is a women's thriller about the search for the divine feminine and the ancient lost origins of "honor killing" in the Middle East. In this post-9/11 cautionary tale, an American writer struggles to "civilize" a tiny Arab village of Israel; her intercession leads to tragedy beyond anyone's calculation...and revelations that could heal what seems hopeless. American freelance journalist Fereby McCullough Jones is struggling to sell stories from Israel when she befriends Leila, a young artist in a village on Mt. Carmel. Leila is a Druze - a secretive, Arabic-speaking, thousand-year-old offshoot of Islam - and shares her double life with Fereby: Painting nudes, lovers and goddesses - taboo subjects in her culture - and selling them in Tel Aviv. When Leila becomes the possible victim of an "honor killing" - the murder of a female by her family for violating cultural gender norms - Fereby witnesses the village celebration, her family's silence and police indifference. Enraged, Fereby launches an investigation that is decidedly unwelcome. With her oddball translator, Moshe, she struggles to unearth Leila's traumatic life story, facing a conspiracy of silence, police and government corruption, a forbidden connection with Leila's brother, Fadi, and danger and backlash she never anticipated. After a shocking turn of events, Fereby is forced to come to terms with her own painful past that's fueling her search. Then, Leila's last series of paintings prompts Fereby and Moshe to make a surprising discovery: The ancient, lost origins of honor killing, which have been suppressed for millennia, and hold some volatile secrets. A mysterious prediction leads Fereby to Leila's killer, but it turns into her worst nightmare: To get justice for Leila's death, will Fereby have to sacrifice something even greater? What price are human rights worth fighting for? Seven Perfumes' author Amy Logan discovered that just trying to discuss the issue of honor killing openly, let alone fight against it, was taboo in the cultures where it occurs. She realized that must be why this violent practice has continued unabated in some places for several thousand years. To try to understand and expose the mysterious underpinnings of honor killing, Logan landed rare homestays with the Druze in Israel and spent a decade researching and building a theory of the ancient lost origins of the practice. As she gradually uncovered a vast and true deception from the birth of honor killing, The Seven Perfumes of Sacrifice began to tell her its story... "An important book with a powerful story that places the words 'divine' and 'feminine' back where they belong: Together." - Sherry Jones, best-selling author of The Jewel of Medina, The Sword of Medina and the forthcoming Four Sisters, All Queens ..".an un-put-downable literary thriller ...The book is Logan's debut, but it surely won't be her last." - Joy Tipping, Dallas Morning News' Book Reviewer. Amy Logan's writing and/or photography has been published in The New York Times Magazine, The Los Angeles Times, The Dallas Morning News, The Denver Post, Vegetarian Times, Natural Solutions magazine and many others. She wrote a nationally syndicated travel column for Tribune Media Services and contributed an essay to the 2008 anthology Mothering Heights' Manual for Motherhood, Vol. 1: What We Wish We Knew Before We Became a Milk Machine, Short Order Cook, Shuttle Driver, Laundress MOTHER (Mothering Heights' Press), which became an Amazon #1 best-seller in the Motherhood category. She has studied creative writing with Booker Prize finalist Arnost Lustig, Pulitzer Prize-winning poet Henry Taylor and National Book Award finalist Andre Dubus III. She attended the 2006 and 2008 Squaw Valley Fiction Writers Workshops. 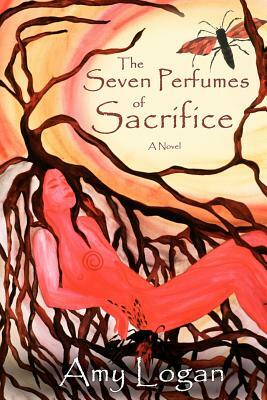 The Seven Perfumes of Sacrifice is her first novel. She may be reached at www.7perfumes.com.